Primark is owned by Associated British Foods and has it’s headquarters in Dublin. It has stores across Europe and now in the United States, over 300 stores in total. Primark specialises in ‘Fast Fashion’ offering the latest styles at really cheap prices. As well as clothing for all the family, Primark offers a ‘Home’ collection in bigger stores featuring a range of homewares for Bathroom, Bedroom and living. Where can I check my Primark Giftcard balance? You can check your Primark Giftcard balance immediately online by clicking here. You can hand over your card at any Primark store till and the team member will check your balance for you. To find your nearest Primark store, click here. Where can I spend my Primark gift card? You can spend the card at any of Primark’s stores in the UK. To find your nearest Primark store, click here. You can’t spend the Primark gift card online at their website simply because the website just provides a catalogue for the stores – orders are not accepted online. Where can I buy a Primark Gift Card? Cards are on sale at all Primark stores in the UK. Cards can also be purchased from selected retailers, including Sainsbury’s and Wilko. Primark have an official online gift card store at http://www.primarkgiftcards.com delivery costs start at £2.00. Primark have now started selling e-gift cards online as well. These are delivered directly to you by email (free delivery) or, you can send them direct to someone else and even specify exactly when you would like it to be sent, which is a great feature for sending on Christmas Day or a birthday. The Primark e-gift store is at https://www.primarkgiftcards.com/Primark/ByEmail/Primark/ChooseProduct. You just print them out and take them along to the store. Anything else I should know about Primark Gift Cards? A Primark Gift card will expire 2 years after the last use. This excludes balance enquiries, so “last use” includes only a purchase made with the card in-store, a top-up or a refund to the card. After 2 years the card will expire and any value remaining on the card will be lost. 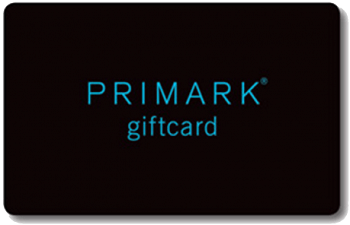 Primark giftcards bought in the UK can only be spent in the UK – so they can’t be used in Primark stores in Ireland (also known as Penney’s) or in other countries in Europe.